The Breakout 8 Writers Prize, sponsored by Epiphany and the Authors Guild, was established in order to honor and support outstanding emerging literary voices and bring visibility to the writers of the future. Earlier this spring, we announced the eight winners chosen by our three judges—Hannah Tinti, Alexander Chee, and Tracy O’Neill. We interviewed each of the winners, and over the course of the next several weeks, we’ll post their Q&As! 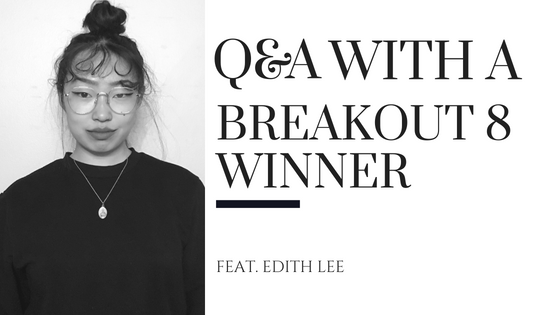 This week, we introduce you to Edith Lee. Edith Lee grew up in New Zealand and is now in her final year at Colorado College. She is pursuing a bachelor’s degree in English with a concentration in creative writing. How did you first come up with your winning piece? These poems cropped up as footnotes for myself—people and memories I thought weren’t worth forgetting. What do you hope to gain from the year ahead? I’ve just graduated college. Now I’m looking to meet as many people and make as many memories as I can so that it’s fine if I forget some of them. Who is your favorite underappreciated author we should all be reading? Do you have a memorable experience of an influential teacher you’d like to share? I was selfish with my first writing teacher and bombarded her with poems that I thought were decent. She had a lot of heart and patience to teach me how to write. It’s been said we write what we obsess over. What themes do you find keep cropping up in your writing again and again? The concept of the bittersweet. How nice things exist, but they exist in a constant state of instability. They’re not yours to keep. Father Christmas Goes on Holiday by Raymond Briggs. If the pursuit of writing is a quiet solo one, what are some ways you connect with other writers? I think the people in my life pursue writing the same way I do—in concealment—so through notebooks, text messages, hashtags. Most of the connections I make with these writers is through observation. I love listening to people talk about what they think is normal, and the way people expect normality from others is so interesting. Also, it’s all on the internet. The way people arrange themselves on the internet will always be fascinating to me. What’s one bit of advice you wish you’d have gotten early on? The way that men write women is not beautiful. What white people write about isn’t beautiful to you. What you write isn’t beautiful to them. It’s okay.